One of our favorite movies of 2016 is Arrival, the science fiction thriller from Denis Villeneuve. Aside from a brilliant script by Eric Heisserer, the film contains stunning visuals, in part thanks to cinematographer Bradford Young, but also thanks to some excellent VFX work. For anyone curious to see how they brought everything to life, including the giant spaceship and their activity inside of it, Oblique FX has released a demo reel highlighting their work. Another VFX company, called RodeoFX, has also launched a page with photos showing before-after shots. It's amazing to see how much of this was filmed with blue screen, yet it feels so real. Seriously impressive. 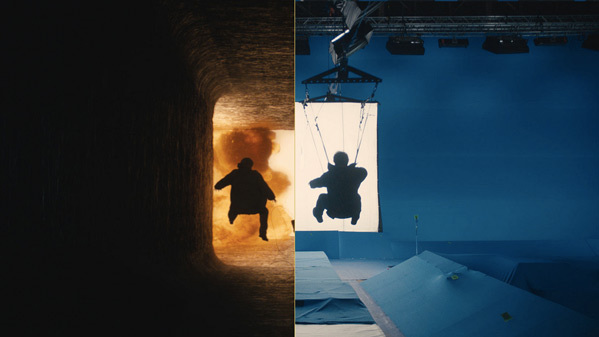 Always so cool to see these kind of VFX breakdowns for big sci-fi movies. For more coverage of Arrival, read Alex's review from Telluride and/or Jeremy's review from Fantastic Fest. When mysterious spacecraft touch down across the globe, an elite team - lead by expert linguist Louise Banks - are brought together to investigate. As mankind teeters on the verge of global war, Banks and the team race against time for answers - and to find them, she will take a chance that could threaten her life, and quite possibly humanity. Arrival is directed by Quebecois filmmaker Denis Villeneuve, of the films Incendies, Prisoners, Enemy and Sicario previously, currently working on the new Blade Runner sequel with Ryan Gosling. The script is written by Eric Heisserer (A Nightmare on Elm Street, Final Destination 5, The Thing, Hours, Lights Out); based on a short story by Ted Chiang. The film first premiered at the Venice, Telluride & Toronto Film Festivals. Paramount released Arrival on November 11th, 2016 - in theaters now. I hadn't thought about that before, but you are totally right!